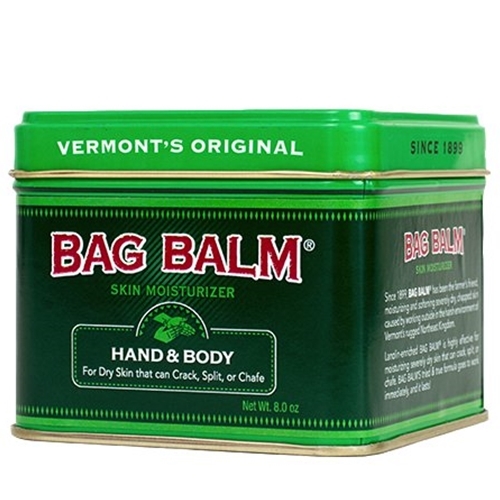 Vermont's Original Bag Balm Moisturizer Ointment from HealthyKin.com was designed for dry, chapped cow udders. Bag Balm works great for any animal's skin. Treat your pet's chapped or brush-burned area with Bag Balm for soothing, moisturizing relief. Bag Balm is also often used as a treatment for chapped and irritated skin on humans. I have used this product since I was a young man growing up on a ranch in Wyoming. At least two generations before me had used it as well back to about the time it was invented. Its a miricle product and I can't say enough good about it for humans and animals with cuts, sores, burns, etc. This was given to a friend who swears by it. After only two days of use, her cracked, bleeding hands are already healed to the point of feeling comfortable again. This product is an "Oldie, but Goodie". It does the job! This product really has done a great job! I will be buying this many times, because works so well. I highly recommend this product! !